“The Holy Clerics of Thandar should not be underestimated. The city changes everybody, and even the kindest and most devout person tends to show a degree of grizzled bitterness after a time. Expect compassion and comfort as always, but don’t be surprised if you encounter a coiled, cynical fury just under that stoic and godly visage.” – The Emperor’s Guide to Thandar. The Cleric Character pack is a solid choice in a party for Campaign play, but how does it handle on its own? Quite well, actually! 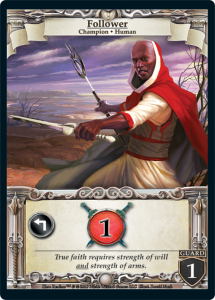 Clerics have traditionally been a support class in fantasy-based games, but in the world of Hero realms, anybody and everybody can go toe-to-toe on the front lines! The main strength of the Cleric is their ever-present Bless ability. 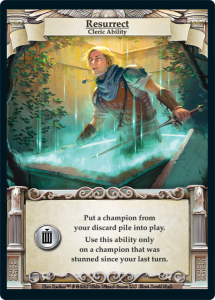 This is a fine gold sink if you don’t want to purchase a gem, but if you build your deck around enabling champions, you will often be able to edge out your opponent. The built in healing of Bless provides a decent way to recover from early damage. However, a mistake that players can make with the Cleric is thinking that they need a healthgain and/or defensive deck to go with the Bless. 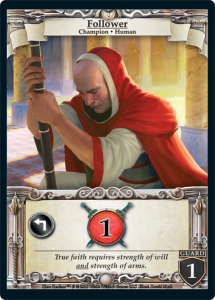 Obviously the Market Row will dictate your opportunities, but like a good Cleric, a good Cleric deck will acquire followers. The Bless ability rewards the purchase of Champions; making your Champions harder to remove and keeping the pressure on. Properly timed, Bless can provide enough defense for your champions to stay in play longer than they would have, and turn an even match into a win. Were your opponent still able to deal with your horde of Blessed Champions, each one absorbs an extra point of combat that would have gone to you. Since Resurrect is a one-time use only ability, make sure to save it for maximum effect. This can mean resurrecting a champion early in the game to make a vital purchase or trigger an ally ability that turn. Resurrect’s real power happens when it is used on an expensive champion to get it back on the battlefield. 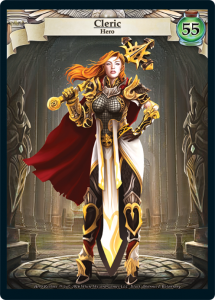 For this reason, a Cleric should value high cost Champions that would be devastating if the opponent was forced to deal with them on consecutive turns. With these expectations in mind, players going up against a Cleric should acquire stun cards whenever possible, and Clerics should be on the lookout for stun cards that the opponent could buy. A Resurrected Champion dies just as easily to a Death Threat, and Blessed Champions don’t get any advantage against stun effects. “If you see a Cleric with a shiny new Mace or young Followers, beware. 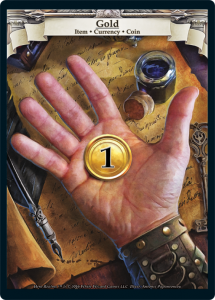 While they might indicate an inexperienced Cleric, it’s more likely they indicate a replacement for something broken or worn through overuse.” – The Emperor’s Guide to Thandar. Fairly standard for a starting deck. Once your deck starts to take shape, Gold cards a prime candidate for sacrifice. Beware, however, the hazards of getting rid of your gold too early. 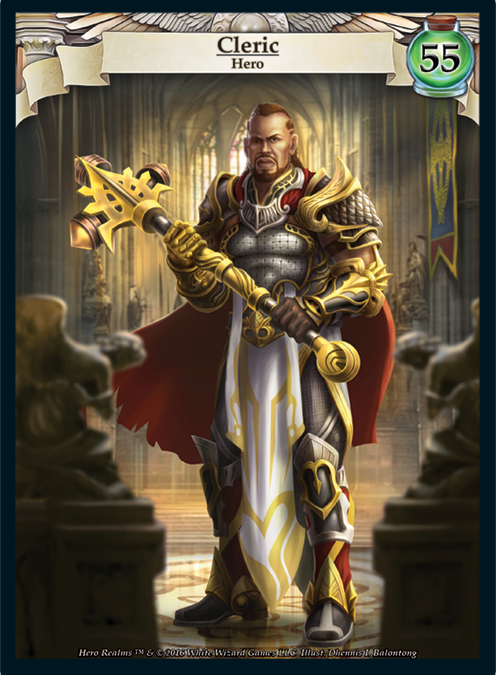 You should always be aware of the buying power in your deck, and if you do sacrifice your Gold cards early, make sure you have cards that generate Gold, or at least a couple of easy-to-sacrifice Fire Gems. A staple of the deck. After a few turns, you should be able to trigger both the Gold and the Healthgain. 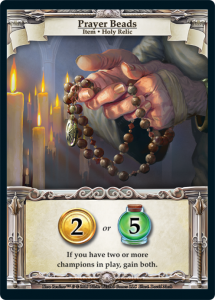 Prayer Beads will often stay in the deck since a gain of 5 health is a beefy swing of points that could put a player out of reach. 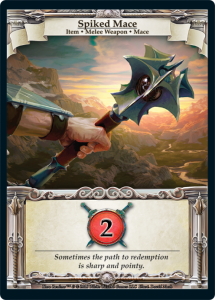 In the early game, it’s good to have a 2-damage spike that could possibly take out an opposing Champion, but this will often be one of the first cards to go. What’s a shepherd without a flock? The Followers, both being 1-damage Guards that can trigger your Prayer Beads, are often workhorses in the early game, and may even survive for quite some time in your deck (depending on your direction). “It’s always best to show respect and give thanks. You don’t want your thanks to be taken from you.” – The Emperor’s Guide to Thandar. Acquiring Champions should be your main goal with the Cleric. 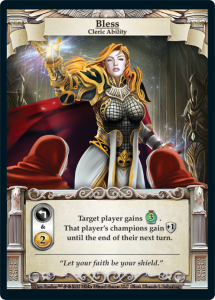 Both of your abilities reference Champions, and a deck with a high Champion count will be tough to overcome at the best of times, but even more so when they come under your protection.